Evgeniy Najer: Who said we would have a new champion? 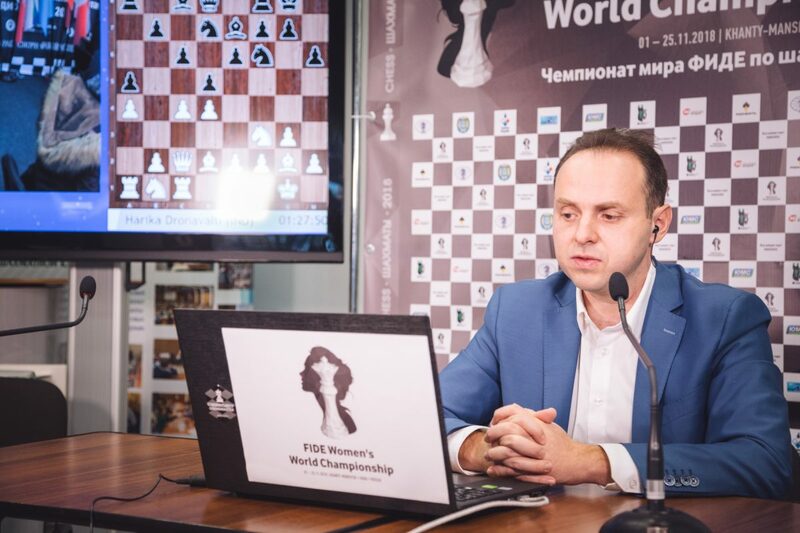 Grandmaster Evgeniy Najer successfully works in women chess – he is strong grandmaster and a coach of the Russian women’s national team. He is also an excellent chess commentator. These days he is responsible for the Russian-speaking broadcasting from Khanty-Mansiysk. 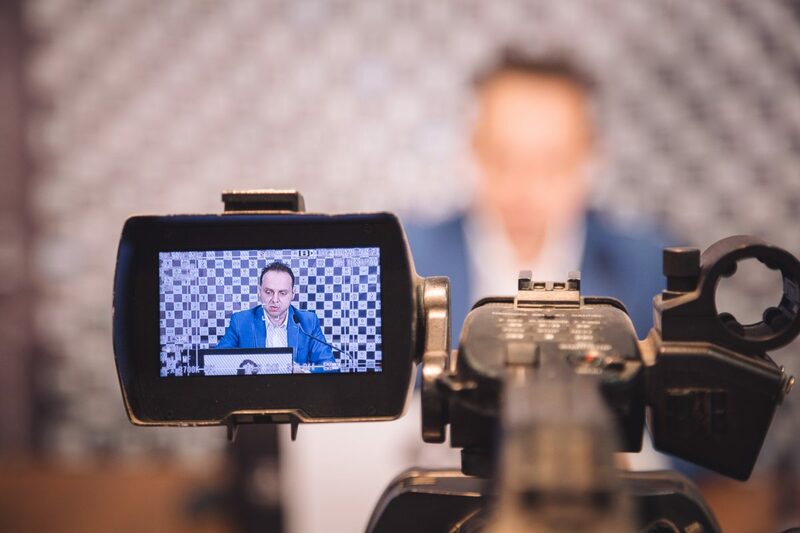 Those of you who understand Russian are welcome to watch his insightful streams, and for the rest of you we summed up Evgeniy’s impressions from the championship in one interview. – Evgeniy, you joined the broadcasting team in the Round 3, but have you followed the championship from the beginning? – Since I have known about this assignment well in advance, and being a coach of the women’s national team, I obviously followed it from the start. However, it is easier for me to discuss the things I saw during my stay here. – What are you first impressions? Surprises, disappointments?.. – The tournament is very strong and intriguing. There are many complexand fighting games – which is quite usual. Judging by the lineup of the Quarterfinals, most of the favorites confirmed their status – first and foremost, the reigning World Champion Ju Wenjun, also Kateryna Lagno, Alexandra Kosteniuk, and Muzychuk sisters, Anna and Mariya. 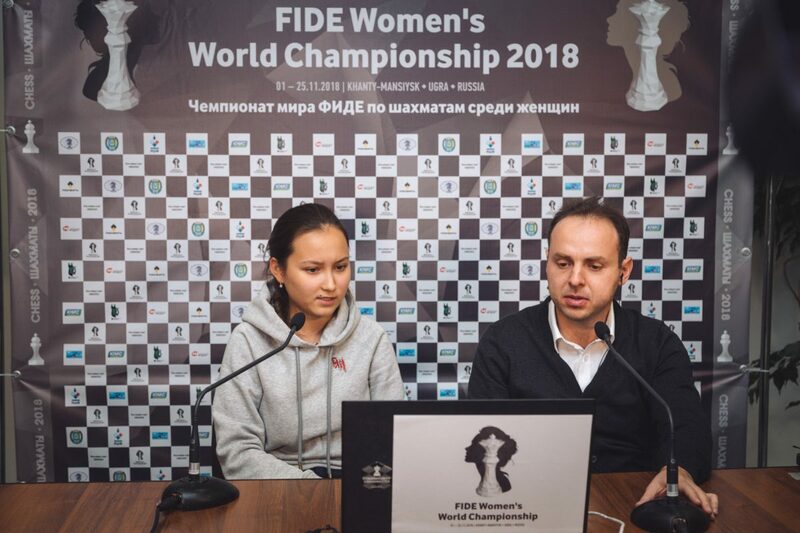 Some of the strong players have been eliminated – Tan Zhongyi, Humpy Koneru, Harika Dronavalli, Nana Dzagnidze, Aleksandra Goryachkina, and a few others. – Are there any new names for you? – There are some. The young Mobina Alinasab from Iran left a strong impression with her play. 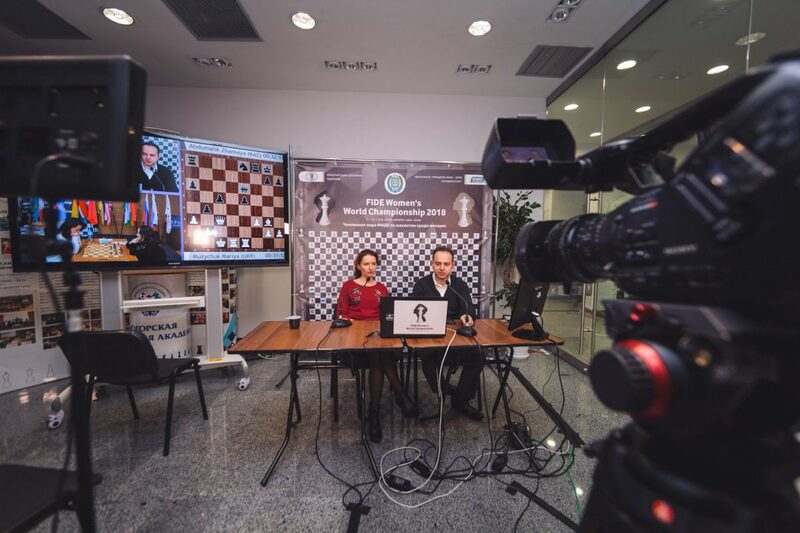 In the 3rd Round she faced Mariya Muzychuk and had reasonable chances to come through. We all should remember her name. It goes without saying that very fewpeople expected such a powerful play from Gulrukhbegim Tokhirjonova from Uzbekistan. Just think about it: she knocked out Alina Kashlinskaya, Tan Zhongyi, and Valentina Gunina! Such a feat would be hard to repeat for many male grandmasters, and would be considered a serious achievement for anybody. Tokhirjonova had a very strong opposition and managed to advance quite far, which is remarkable. Now she faces the World Champion. If she knocks out Ju Wenjun as well, it will be a hugesensation. Zhansaya Abdumalik is in my opinion one of the hidden favorites of the championship. Her overall victory will not be too surprising. Despite her tender age, her play has been very strong for quite a while. – What is your impression from overall quality of the games? – I have mixed feelings. Generally, it is not different from other tournaments of similar level. The level of play is solid, the quality of games is quite high. Particularly Ju Wenjun looks like a player without weaknesses. Others are somewhat less consistent with their play. – Is Ju Wenjun the main favorite of the championship then? – Although this is a knock-out event, the question whether we’ll have a new champion is legitimate. Right now I can’t imagine who can beat her or how they’ll do it. She plays very good chess and has excellent nerves. However, she is yet to play some of the main contenders, and nobody knows how their clash may end. – Who is the main favorite for playing Ju Wenjun in the final? – I do not dare predicting it. There are quite a few possible alternatives. – What is the critical factor of success in a knock-out event? – The overall success in knock-out events is largely dependent on how strong is your rapid chess. Yes, good nerves and ability to handle stress are also quite important, but strong rapid chess skill is the key. – Being the national team coach, do you pay special attention for the Russian participants? – Naturally, I watch them very closely, but I do not pay them extra attention as a commentator. – How comfortable are you at the commentary booth? – This is still a relatively new role for me. I am not completely at home sitting there alone, I prefer towork in tandem with another commentator. Then I have time to analyze the position and understand what is happening, while being alone I have to talk all the time – and this is not easy at all. – Is it important for acommentator to give precise evaluations, or should he live through each game emotionally together with the audience? – Do not forget that I am a player and coach first, and only then a commentator. So when I overlook that a queen wins against a passed pawn, as it happened in Kosteniuk – Harika, I feel dread. I want to succeed in everything. The required skill set overlaps with the one of a strong blitz player. Still, I enjoy this kind of work and will continue doing commentary. – Do you consult with engines during games? – No, because it obstructs my thinking. When I see the computer line I trust it too much and suppress my own ideas, which may be of some interest. I am unable to synchronize myself with the engine, therefore I don’t do it.